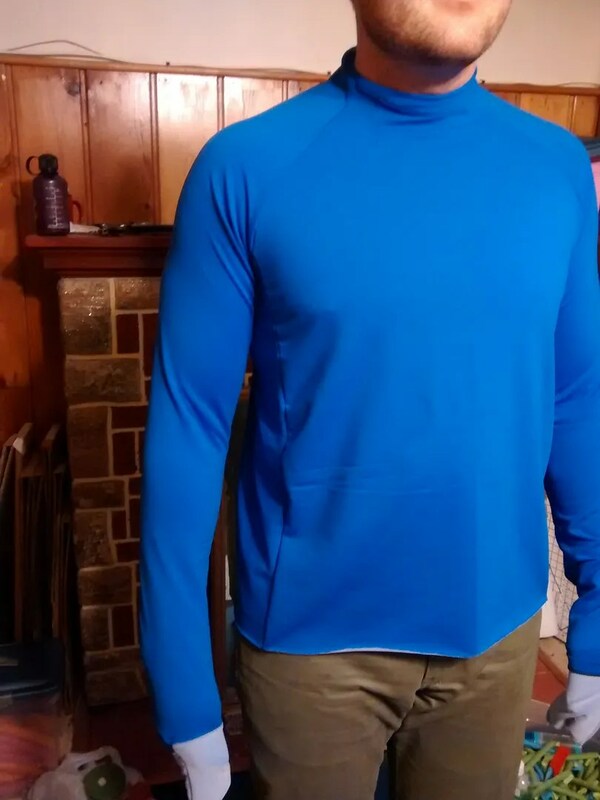 Over Thanksgiving I pattern tested Melissa Fehr Trade’s Surf to Summit Top for men. Note, I didn’t make one for myself because I neither surf, nor summit. Jordan on the other hand snowboards, runs and bikes. One time we went running together and I *begged* him not to run with me. I get really self conscious about what a slow runner I am. And, I kind of hate being encouraged when I run. Just let me run in peace and self loathing. He wouldn’t do it and jogged along with me at my 12 minute mile pace. The next day, he had shin splints. Because, it was like he was jogging in place. ::sad trombone:: We haven’t gone running together since…. Both the men’s and ladies’ versions feature princess seams, side panels (so no side seams! 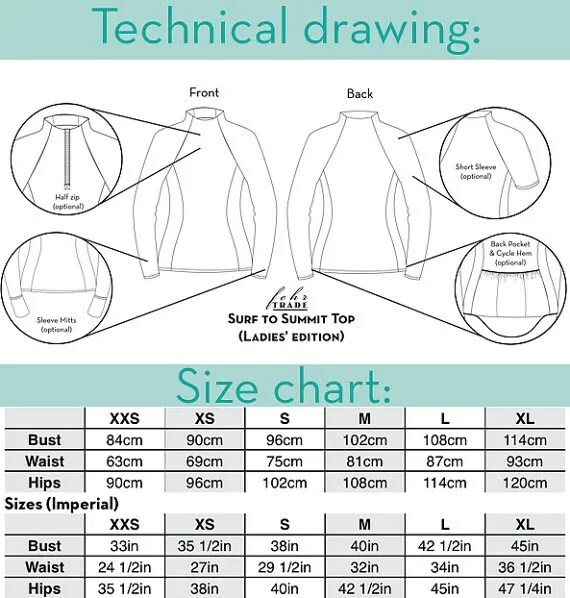 ), your choice of long or short raglan sleeves, optional sleeve mitts for keeping your hands warm without fiddling for gloves, a tall integral collar to keep your neck covered, and your choice of two hem lengths. An optional half zip and back cycling-style pocket are also included. 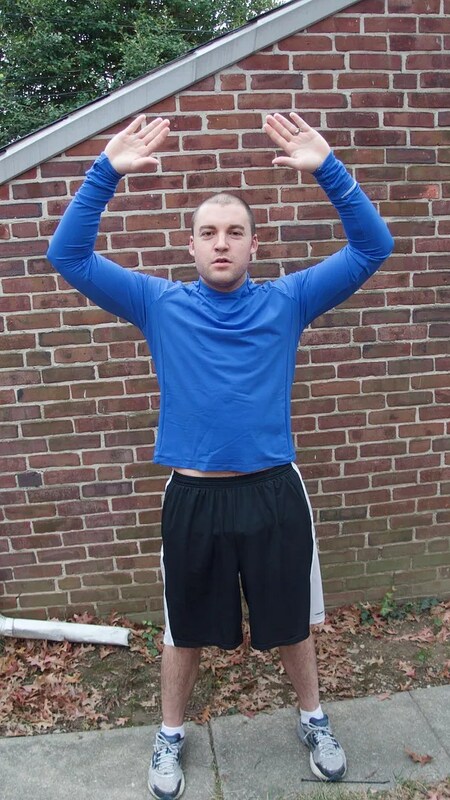 I made the pullover in long sleeves with sleeve mitts. I would have done the half zip, but didn’t have a zipper on hand and wasn’t trying to go out over Thanksgiving to look for one. Guys, I get the love of a PDF pattern — instant gratification and no shipping. But, I’ll only sew them if they are copy shop. Period. I know there are faster ways of taping, but I won’t do it. Some people won’t upgrade to smartphones and get on Facebook. I won’t tape PDFs. So, I was really happy I could get this one copy shop printed. For Jordan, I first sewed a straight Large. His chest measured 42.5. 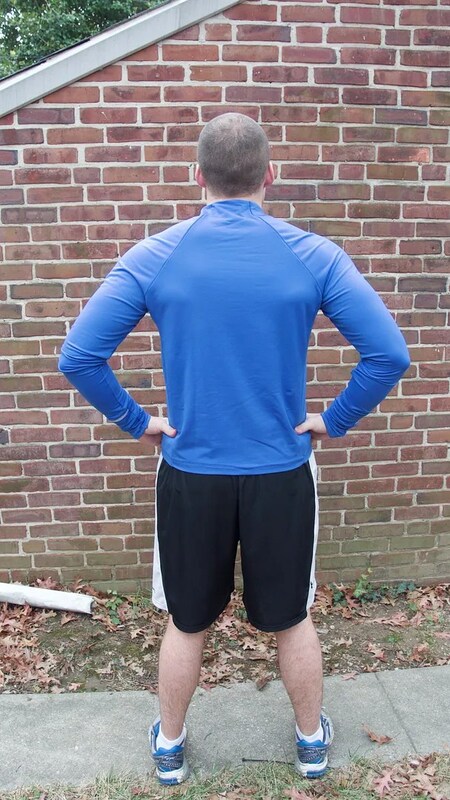 Jordan’s clothing issues are short torso, broad chest, large biceps and somewhat narrow waist — but with a little extra weight around his middle. After taking photos so she could see how the straight Large fit (above and unhemed), I took three inches of width from the waist. 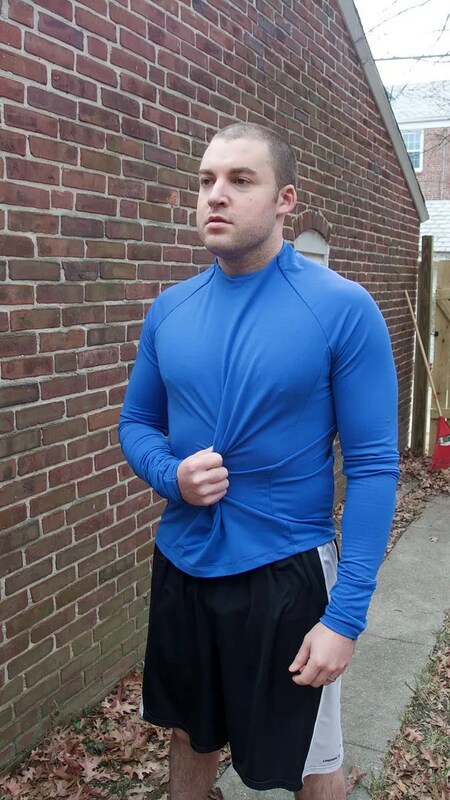 Jordan wants it even tighter next time so it’s a more a true compression shirt. When I sew it again, I’ll also add one or two inches in length. At first he said it was fine. Then, he went for a run and admitted his stomach got cold. I really like these run mitts. When sewing them, I had zero idea what they were supposed to look like. And, feared I’d sewn them wrong. But, they are correct and Jordan said they worked brilliantly. But, he felt some stares when we was running, but said they worked so well his hands were sweating by the time he got home. Below on the left is the run mitt and on the right what it looks like when not engaged. Finally, I made this up in some of my hoarded Under Armour Cold Gear. I have two more pieces of it left in red and sage green. I’m saving the red for myself and donating the sage green to his exercising cause. This went together really quickly. All serger construction with my coverstitch for the hems. I think I need to make some fit tweaks. I’d like to try an XL on top and through the arms and taper to a medium in the waist. I’ll also add some length at the bottom. And, this summer I can sew him some bike versions from the Nike fabric I bought in Minnesota this summer. Plus, with the seaming details, there’s plenty of opportunity for me to use some reflective tape to make him a bit more visible in the wild. I’ve sewn some more holiday gifts for Jordan that I hope to blog after Hanukkah this week. In the meantime, Happy Hanukkah to those who celebrate. And for those of us waiting for Christmas, it’s less than two weeks away!! Allow me to leave you with my new Christmas tree. Because, I can. Jordan does not look like all that happy a model, but I’ll be he loved that shirt. Fit issues are so hard in men, probably because they are different from our feminine fit problems. Happy Hannukah to Jordan and you (by association)! What a great wife! You pattern tested something for just him – you are pretty awesome in my book! *LOL* You know me being a selfish stitcher and all…so glad this will work for Jordan especially with a few adjustments! And of course your tree is pink – so it’s the perfect Christmas tree for you! Fantastic first version and what a lucky husband to get custom made sports gear! The mitts must be toasty and handy to flip up out of the way. But…now Miss Renee…about that tree…EYE-POPPING! Santa will not miss visiting your house for sure! He might even forget you left out cookies for him and carrots for the reindeer! What a lucky guy he is that you are seeing for him. AGAIN. I love how he is all in to the poses. The mits are a brilliant idea. Love the shirt and the color suits Jordan very well.. It is a very nice thing to do. I sew short sleeved, Hawaiian style but not fabric, casual shirts, and boxers, Kwik Sew patterns for my husband, and will soon be making a true dress shirt for him. I like the boxer pattern, made with men’s shirting. The next shirt will have matching boxers! Love the Christmas tree!!!! Thanks for the info on the pattern. I have a son & DIL who are big bikers and would love some of those shirts! I think I will try them. Thanks for all the info and the professional modeling. LOVE the tree!!! Happy Hanukkah! Whooee – love that Christmas pink. Got a question for you. I dislike PDF patterns too and will go out of my way to buy the paper version after I did a purse (all rectangles) and died trying to copy the gazilliion pages plus the pattern pieces. You can take the PDF to a copy place? Do you email it to them? I never thought to do this so I would appreciate the minutiae. Do I need to change or get something other than a PDF file? Hey Kathy! All the patterns I’ve bought from Thread Theory, Closet Case, FehrTrade and Gridline have a ‘copy shop’ print version. You can email the copy shop PDF to FedExKinkos or Staples and ask them to print 100 percent scale on a plotter. I have a friend of a friend who works at a company with a plotter, so they print them for me. But, the one time I had it done at a print shop it was $7. Also, if you know anyone who works in graphic design, IT, architecture, GIS mapping — they might be able to print for you. For me, it’s the best way to go. I feel kind of wasteful printing all that paper, I hate the taping together, blergh. Just not a fan. But, with copy shop, it’s so easy! I do still trace the pattern from the print out. But, no taping! Holy friggin Christmas tree! I’m in love! And I tested the man version of this top, too. How easy was it to make, right?! My husband likes those mitts, but we’ve all been sicker then heck for weeks and no one has been lifting a finger past anything necessary and he hasn’t run in it yet. I’m going to make me a lady version in the next couple wks. And PS I run 12 min miles. I don’t give a flying piglet who judges me, but I also am a solo runner who runs in the woods at Druid Hill or Robert E Lee Park so no one can see my jiggly parts as easily. Glad someone else is participating in selfless sewing. While this is not a “glamorous” make, it’s pretty awesome. I love the glove idea but think I would receive stares as well. May I ask where you purchased the fabric? Hi Maddie! It was from a great store in Baltimore called Guss Woolens. Under Armour is based in Baltimore so the owner could get ends from them. But, Guss Woolens has since closed. I’ve tried emailing the owner about still getting UA, but it seems he’s focused on menswear fabric 😦 If enough people here say they are interested, I might email him and see if he would do an online pop up shop. It was only $5 a yard! I LOVE your tree! Fabulous. Wish I was coming to yours for the holidays. And love the shirt obviously. Did you make any decisions about your Christmas Coast? I found some gorgeous vintage dove grey herringbone in London. Not enough for a coat, so I’ve downgraded the christmas Coat to the christmas Jacket. Debating sewing the 1/2015 Burda asymmetrical, or the blazer from earlier this spring that had 15 pages of WTF devoted to it. I *think* I am going to do the coat you made in cream. I have a navy wool cashmere that I can sew it up in. I just need some time to muslin it out. I also am thinking about a Burda duffle coat in Burberry plaid wool. I saw Grainline has a duffle pattern coming out too, so I might have a look ta that. So, yes. Still planning a coat. But, Christmas might be the soonest I could start. I also want to make a blazer!! I think the January issue has one that I thought was really really cute. Great top and once you get the fit sorted, he will never want to buy another running shirt again! I am going to make this for rashies (sun protection swim top) for my DH and probably for me too as we are thinking of buying some kayaks early next year. What a lucky guy! You know the downside of this is that he will never be satisfied with another RTW shirt for exercising, right? I, too, will not tape pages together. I just won’t! I’m sure it is not that big a deal, but I have a mental block about it. I haven’t tried the copy shop route yet. Wow. That is an amazing tree! I bought a bunch of Under Armour fabric a while back and can see this top in several versions for my daughter. check plus for you!!! bold tree. The shirt looks really good on him. 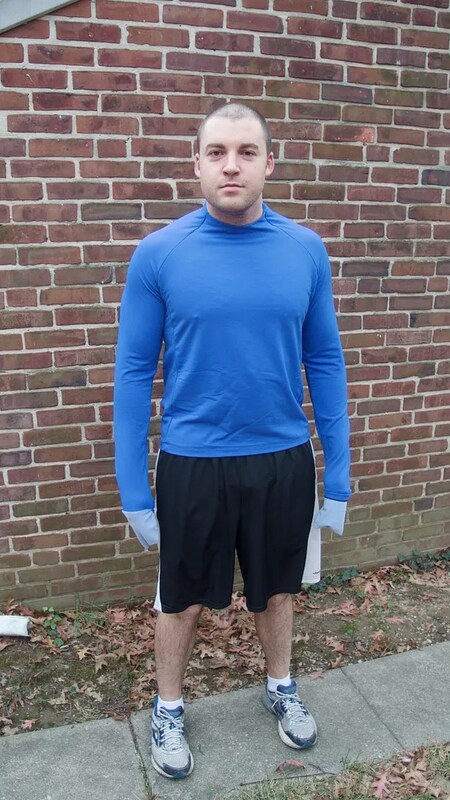 I just finished a running shirt for myself and added cuffs with thumbholes, It might get less stares, but if it´s really cold then the mitt option would be warmer I think. 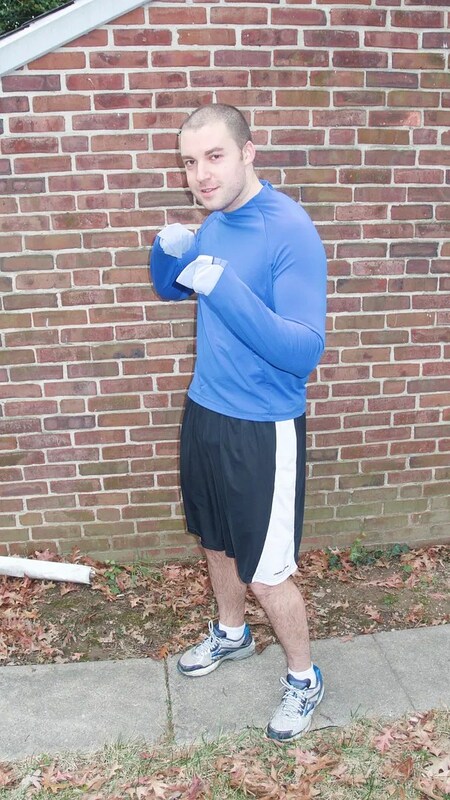 Great, informative activewear post! But…. why is it snowing across your hubs’ pictures? And…your pink Xmas tree gave me my laugh of the day. 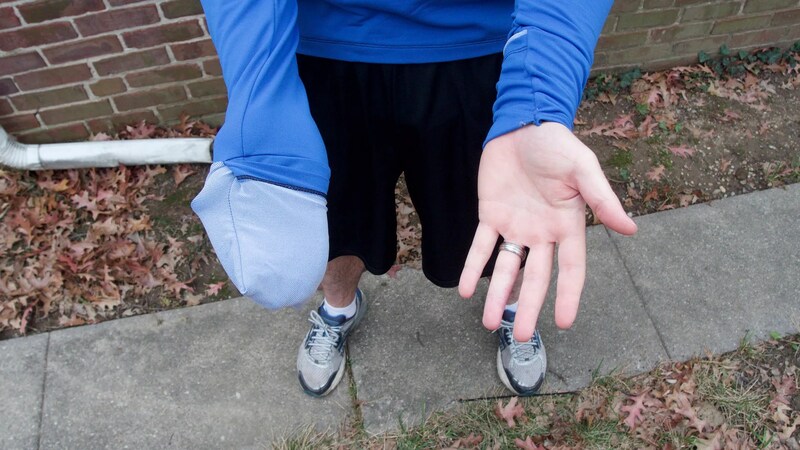 As a runner, ewww I love the running mitts on this shirt!!!!! That alone makes it a good shirt to me! OMG your tree is FABULOUS!! Hahaha!! 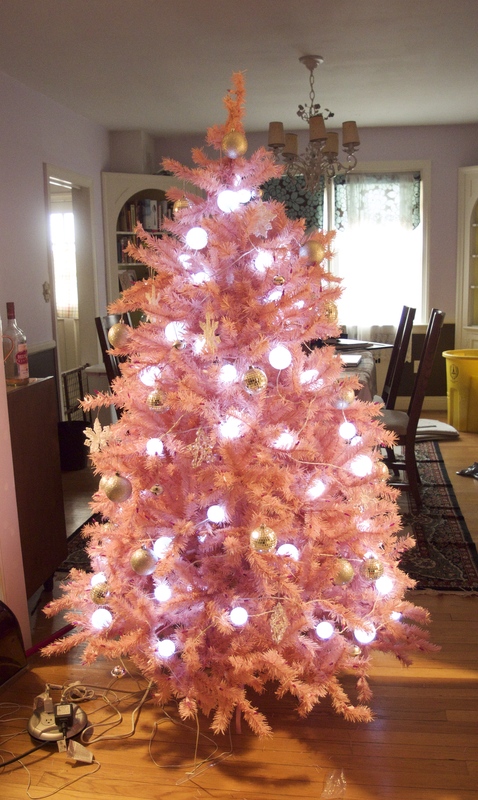 Now I really REALLY want a pinky-peach Christmas tree!!! But yes, the shirt! Also fabulous. I am so intrigued by performance workout wear! It’s really like a bit of a different language from regular garment sewing, to me. And as I’ve just started seriously working out these past 6 months I can really see the need for stuff that holds up, moves, breathes, regulates temperature and all that. Jordan looks super great in his new shirt!! You did an awesome job, and I’m sure round 2 will be even more ideal. I just might have to try out some of Fehr Trade’s fitness based patterns! Renee, you did an awesome job! I know how you feel about running! Have you tried spin cycling? Check and see if there is a spinning studio in your area. A great way to exercise and burn calories. I love it! Happy Hanukkah and Merry Christmas! Renee, what is copy shop printing? I hear you on the .pdf files. Whatever convenience of .pdf is immediately negated by cutting and taping or by having to go to the copy shop. Whatever cheapness of not paying shipping is immediately negated by copy shop printing fees. The mitts are awesome. Actually, they remind me of baby onesies, which often have these little flip-up mitts to protect babies from cutting their own faces with their too-sharp fingernails. “Just let me run in peace and self loathing”. –> THIS. Blake and I ran together exactly one time. NEVER AGAIN. Yas!! Maybe I need to get my 70 year old dad to run/ work out with me. Much better fit.